There has always been a great deal of collaboration between the 4 UK countries when it comes to learning how best to implement population screening programmes. Abdominal aortic aneurysm (AAA) screening is no exception. A 4 nations committee meets regularly to discuss AAA screening across the UK. It recently produced a report highlighting screening data from each UK screening programme. This report covers the financial year from 1 April 2014 to 31 March 2015. Similar reports for more recent data are planned. This blog summarises the data, though the full report contains additional notes about how the numbers were calculated. 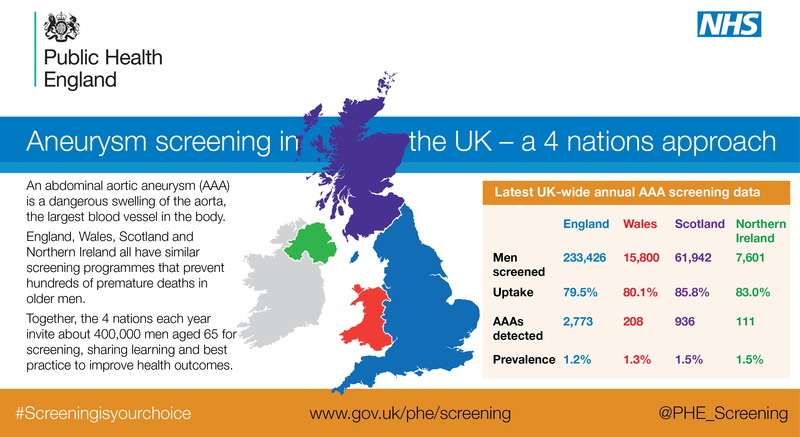 AAA screening for men in their 65th year has been available across the UK in all 4 nations since April 2014. England, Wales, Scotland and Northern Ireland share the same aim: to reduce AAA-related mortality among men aged 65 and over. Working collaboratively, all 4 nations benefit from shared learning in terms of how to improve the quality of the programmes. Normal/no AAA (less than 3 cm) – discharged from the programme. Small AAA (3 cm to 4.4 cm) – added to annual surveillance programme. Medium AAA (4.5 cm to 5.4 cm) – added to 3-monthly surveillance programme. Large AAA (5.5 cm or above) – referred to the local vascular service. April 2014 to March 2015 was the first full year of screening where data was available across all 4 countries. A summary is shown in the table below. Men over 65 are not invited routinely but can refer themselves for screening by contacting their local programme. Men who self-referred and were subsequently screened are included in the table below. One of the most important elements of the screening programme is what happens when a man is found to have a large AAA. Programmes must refer these men to treatment centres that follow the Vascular Society for Great Britain and Ireland (VSGBI) framework for improving the results of elective AAA repair. Results against pathways standards are shown below. All 4 countries’ screening programmes are committed to reducing health inequalities. Using available data to ensure equity of access and uptake is a fundamental part of the screening process. It is planned to include this in future reports. My mother died from an AAA - is there any plans for screening women. Sorry to hear about your mother's death. Abdominal aortic aneurysms are much more common in men than women and there is no currently evidence that screening women would meet the UK National Screening Committee's criteria for a population screening programme. However, the NHS AAA Screening Programme is supporting research in Leicester that will try to work out whether some form of targeted screening for women might be an option in future. We expect to see the results of this research in a couple of years' time.